You need to insert a 6MM allen into the hole and turn it counter clockwise then get it setup. Then tighten the center 12MM bolt. Thanks. Always good to have an excuse to buy new tools and bits. Well, it's done. Everything turned out great. Thank you Alan, a.k.a. "tech" for the help. Now, anybody that thinks they can go to 108k without changing the belt better get it checked soon. My belt, upon better inspection, is actually worse then the pics tech posted. There is one point where the crack goes all the way across the belt. 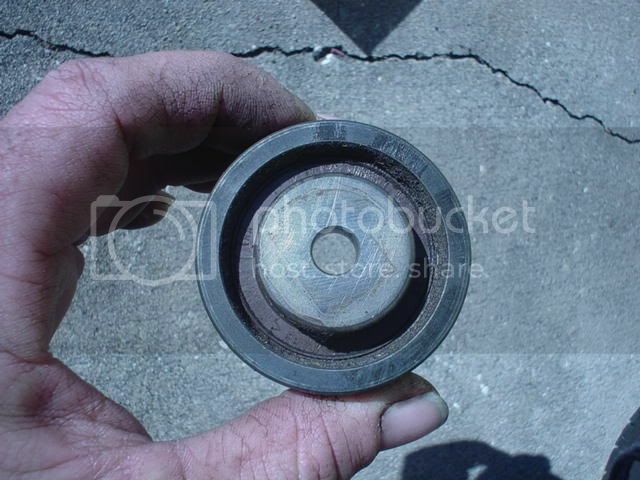 Secondly, both the idler pulley and the tensioner were leaking grease, just like tech showed in his pictures. It's a good thing I bought the replacements. I just hit 75k miles this week. I'm very glad I listened to the info on here. I seriously doubt this car would have lasted through another sub-freezing winter. I can only imagine what that belt would have done on a few 0 degree starts. I would advise anybody with this 2.4L non-turbo engine to get their belt changed at 75k. I will post pics of my belt and pulleys/tensioner later on in the week if anybody is interested. Glad it is all done. Hello all volvo fans, I just today bought my 3rd Volvo,(previously we had a 1971 164 and 1991 240 wagon) today we bought a 1998 V70 t-5 wagon in outstanding condition with most service records and books, while looking over the paperwork, in one place it recommends timing belt replacements at 70K intervals, well mine was changed at 70K, but now has 137K, is there a way to check the condition visually? Very thing in the car works and it drives great, but there is some ratling coming bron the rear tailgate. You can remove the timing cover and inspect the belt. Move the coolant bottle out of the way. There is one screw in the front of the timing cover. Remove screw and slide the cover up and out. Then inspect the belt. Ok, got the cover off and I have to say the belt looks great, no cracking and no grease from the bearing. So how important is a belt change at 140K, when I'm positive it was changed at 71K and may have been changed at 105K as well(not sure of this as there is a tag near the belt say changed at 71K, but no other). Also what is the average cost to do a belt change at a reputable shop? Prices will vary depending on alot of thing best would be to would be call around. You are way better getting it done than either junking the car or paying 2 to 3K for a new head. I think the belt job is between $400.00 and $600.00. Thanks again, you were just about right on, one shop want 630, and recommends a water pumps at the same time for an additional 230, other shop is 475 and 300 for the WP(didn't mention it until I asked). Do you think a water pumps is a good idea, even if it's not leaking? Alot of people don't change them unless they are leaking. They wanted $230 additional for the water pump? That's insane. You can buy the part for $30 and it takes less then ten minutes to do when you change the timing belt. It's the easiest water pump I've ever seen to change! Sounds familiar. In general belts needs to be replaced around 100.000Km, I would include the large pulley wheel and the small part shown on your picture. My Turbo Diesel 2.5 has done 310.580 Km and has been "Rica" tuned to 174-180 Hp. Fantastic! I just the belt with everything that needs replacing, including the water pump. Actually because of my noise complain. It's still there not as loud. Noise (a rattle) sound, could be a loose valve or something touches another metal. But than again Volvo garage needs to check again and I doubt if it is the valve because the power is not legging. I'm looking for a bright LED lights to fit in the air inlet. Could someone give me an advice where and who to contact please. can you repost the pics? I'm late to this discussion and want to see what they look like when they get worn in addition to the location of these parts. Pics are on the first page. I can't see them. are you using photobucket. if so, I won't be able to look at them. not sure why that is. is there any other way you can post them then? I really want to see those pics. I don't have them saved to my PC anymore. The PC they were on crashed and I lost them that way. I will see if I can post them as an attachment.